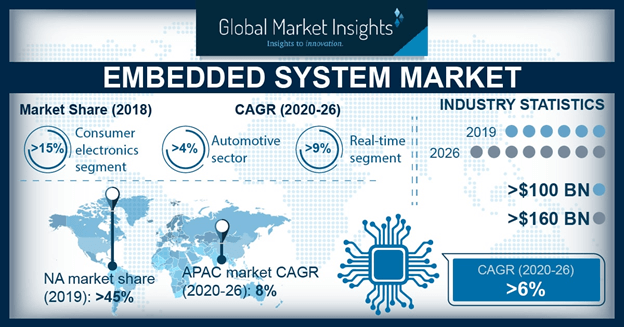 Embedded system market size is expected to exceed USD 258.72 billion by 2023, growing at 5.6% during the next six years. Innovation in technology along with mounting smart grid initiatives is likely to fuel industry demand. Embedded software was valued USD 9.5 billion in 2014 and is anticipated to reach over USD 18 billion by 2023. Introduction of wireless connectivity such as RapidIO and Infiniband standards enhanced the performance of mechanical as well as electrical systems. In addition, it offers improved data analytics that mainly functions on advanced embedded systems. IPv6 standard is an augmentation of TCP/IP, and is likely to be the one of the advanced Internet Protocols (IP) embedded in operating systems (OSs). Moreover, Simple Object Access Protocol (SOAP) and Extended Markup Language (XML) data exchange standards are anticipated to improve interoperability and communications. Proliferating demand from end use industries such as healthcare is likely to drive embedded system market size growth. Mounting healthcare expenditure coupled with escalating longevity of the population result in the need for advanced and affordable medical equipment. The reduction in embedded hardware cost as well as increasing demand in healthcare sector is anticipated to surge the industry demand over the forecast period. Rising adoption of medical devices such as ECG signal monitoring mobile embedded systems, blood glucose level monitors and heart rate monitors in healthcare system is likely to fuel the global demand. Internet of Things (IoT) market is a network of physical objects implanted with sensors, software, connectivity and electronics in order to exchange data for the effective and efficient operation. It requires analysis embedded as well as data management systems to effectively utilize the data gathered for the optimal functioning of devices. However, security concerns are likely to pose challenge to the demand growth over the forecast period. It is essential to safeguard the embedded system from unauthorized software and other vulnerability problems such as theft and data privacy. In addition, continuous efforts are being made in order to tackle these concerns and securing the systems from thefts and data hackers. Automotive embedded systems market accounted for around 22% share in 2014, with gains estimated at 5.5% from 2016 to 2023. This can be attributed to increasing adoption of smart vehicles to offer effective navigation capability and car-to-road communication. Moreover, escalating penetration of electric vehicles and hybrid electric vehicles for ensuring emission control is also expected to drive the industry demand. Healthcare holds the second largest embedded system market share, growing at a CAGR of over 6% from 2016 to 2023. Rise in demand for portable as well as handheld medical devices such as vital sign monitoring system is expected to surge the global demand. Embedded hardware systems was valued at over USD 144 billion in 2014 and is expected to observe significant gains, with forecast of USD 240 billion at a rate of over 5.5% from 2016 to 2023. Increasing economic growth of emerging nations such as Brazil, Taiwan, China, India and Russia are anticipated to adopt new technologies, which in turn, drive industry growth. Embedded software consists of tools, middleware and operating systems. Increasing use of Java in mobile devices in order to develop, interact and control with the assistance of near-field communication, and image recognition technologies is likely to surge the demand growth. In addition, acceptance of IoT in near future is anticipated to positively impact the industry growth. North America embedded system market size was valued at around USD 49 billion in 2015 and is likely to attain 84 billion by 2023 at a CAGR of 5.7% from 2016 to 2023. Europe is expected to exceed USD 62 billion by 2023, at a CAGR of over 5.3%. Asia Pacific embedded system market size was valued over USD 46 billion in 2014 and is anticipated to reach USD 81 billion by 2023. This can be mainly attributed to easy availability of skilled professional in software development. In addition, presence of fabrication plants in the region has also lowers the manufacturing costs over the forecast period. The global embedded system market share is moderately competitive, and the top four competitors accounted for more than 45% share in 2015. Renesas Electronics accounted for over 25% of the industry share in 2014 and offers wide range of components which in turn intensifies the dependency of OEMs. Other key players include Infineon Technologies, Freescale Semiconductor, Samsung, Atmel Corporation, STMicroelectronics, Texas Instruments and Microchip among others.